Mummy Of 3 Diaries: Review - Mini Micro Seat. Is It A Scooter? Is It A Ride On? 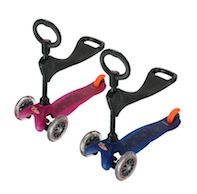 A twist on Micro Scooter’s original Mini Micro means you no longer need to buy lots of different, bulky ride-on toys. The innovative Mini Micro Seat is a safe, sturdy seat that clips into a Mini Micro scooter allowing really young children to surf the kitchen floor. It grows in stages with a child - as ride on, a tiny scooter and a Mini Micro - until they reach the age of five making it great value. The Mini Micro Seat starts life as a more traditional ride on. Toddlers who’ve just found their feet have the reassurance of a seat whilst they learn how to ‘push and ride’. 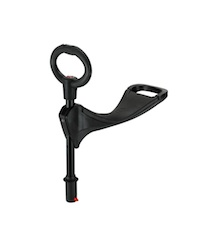 The seat is attached to a sturdy plastic stem featuring a rounded handle which is perfect for little hands to grasp. The stem and seat then lock into a Mini Micro three-wheeled deck and off you go. As a child grows and becomes steadier on their feet, the seat can be removed from the stem to create their first little scooter. When they are ready to pick up the pace, the plastic stem is simply swapped for a traditional Mini Micro T-bar. For parents with several young children who are wanting to economise this Christmas, Micro Scooters UK will be selling the seat and stem separately. This means an existing Mini Micro already outgrown by an older child can be turned into a Mini Micro Seat. 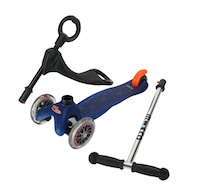 At just £29.95 for the seat and stem, it’s a cost-effective way to ensure a young child gets their first scooter. Alternatively, you can buy the Mini Micro Seat as one complete package which comprises a three-wheeled scooter, the seat and stem together with a traditional T-bar. The three-in-one option costs £74.95. The Mini Micro Scooter was really easy to put together, I managed to do it in less than ten minutes. It's simple, follow the instructions, slot the parts together and fasten them tight. Ryan was so excited when he saw his new toy. The smile on his face was priceless. From the moment he saw it, he loved it. He's on and off it all day, everyday. 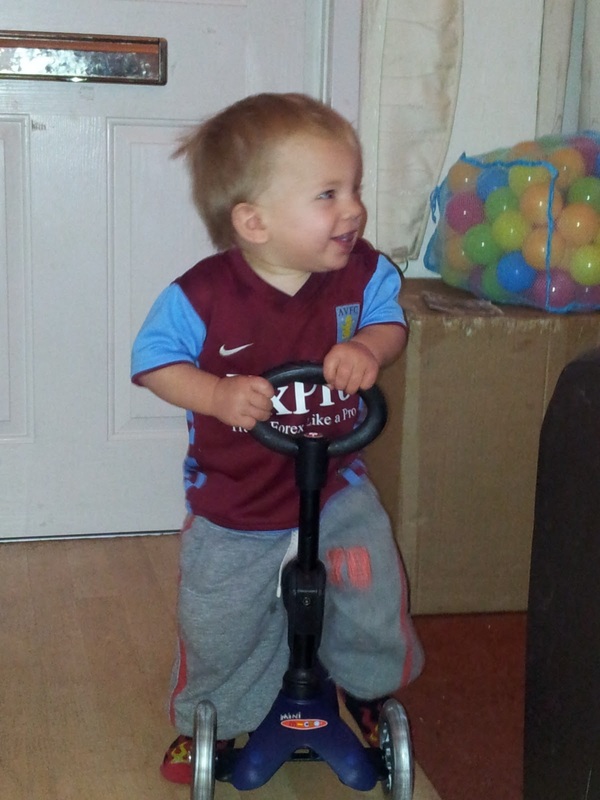 Ryan is 18 months old now and just the right size to sit on the micro seat. He's getting better at pushing himself along. I'm sure it won't be long before he's a big boy and will be scooting along standing up. I'm not sure that he'll want too though as he really likes his seat. The seat is all padded so it's really comfortable to sit on. Ryan even sits on it whilst he's watching TV sometimes, I think he's become quite attached. The scooter itself is well built. Its got a strong base and 3 solid wheels. It's very sturdy. I love the colour, its a nice dark blue with see through plastic wheels. The seat has a little handle at the back so I can grab onto him if I need to. There is a big O shaped handle for easy grip which makesit easy to steer and handle. There's even a little orange coloured break at the back too. 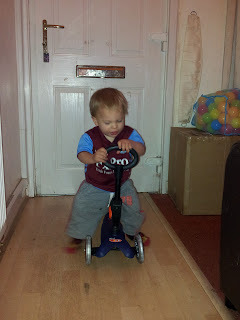 I can happily say that Ryan is going to be riding on his Mini Micro Seat Scooter for a good few months to come. He loves to zoom around my living room on it. 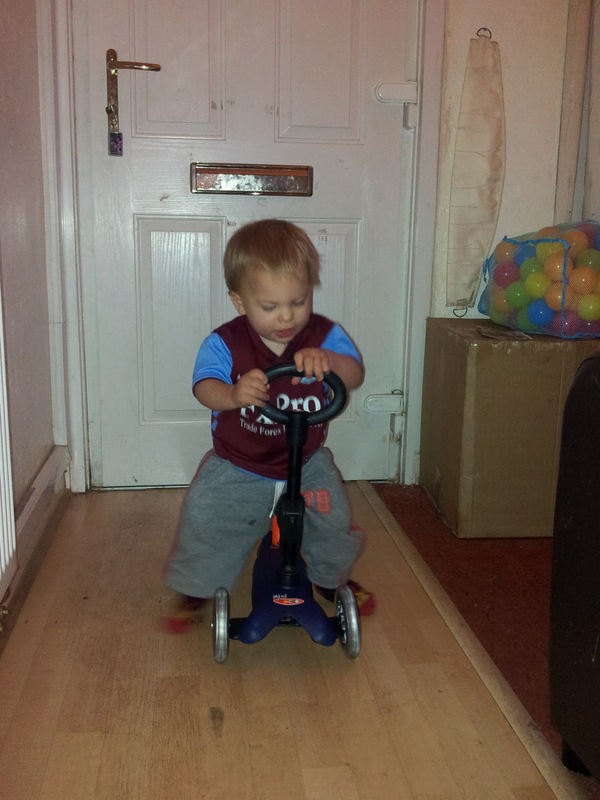 We have a laminate hallway which he thinks is great as he slides up and down it for ages. Ryan gives his new scooter a huge thumbs up and says "Mine" every time one of his sisters gets close. It's a fab scooter and I really love the way that it grows as he does. The parts are really easy to change over so I'm not worried about moving onto the next stage. It's all one big adventure for Ryan and one peaceful life for me. I don't have to worry that he's something unsafe as I think Micro Scooters are very safe. The seat is low to the ground and the balance on it is fab. Mummy of 3 Diaries gives the Mini Micro Scooter and Seat a well deserved 5/5. There's not a thing I would change about it. It's perfect just the way it is. You can check out Micro Scooters HERE. I am wondering to buy electric kids scooter. Please anyone can here provide me list about its characteristics and safety advantages. I think that is amazing. Its clever and it almost looks like its meant to be. It also looks like the scooterbands things can still sit at the bottom of the scooter :). Sorry I love them. I like this Micro Scooter’s with New Mini Micro Seat. This types of scooters are very useful for make your kids active. I really like this types of ride on, a tiny scooter and a Mini Micro for my kids.